I am totally beside myself as to where Pope Francis is taking us. I know we are to love our brothers and sisters of other faiths but this has taken it too far. prepare to “celebrate” the reformation is just mind blowing. as that is what will set them free. I find it insulting and disgraceful to the many martyrs and people who have suffered through the centuries because of what Luther started. I think it is time to get out the sackcloth’s and ashes and start some good old offering up and beg God to get us back on coarse before we go over the edge. Saint John Paul The Great pray for us. Don’t think that I would have done this if I were in the decision making position. It does reach out but many will not support it. We need to get together but this may not be the right way. Why? Why Steve? Just Why? Honoring this man? Since when? When did ecumenism turn into relativism? with all the problems in our church today, the traditional group and the wishy washy group and after reading what Athanasius has to say, reminds me of the war of Gideon against the midianites. May be God will shrink our Church first before we fight the battle with satan,( all the evil in the world) so all the Glory will go to God. All we have to do is stick to the true traditions of our faith handed down to us and not fall for the rubbish going around us today and Pray to God for Mercy like you neve done before, like the Ninevites. May God Bless us and spare us, your people. I am deeply disgusted by this commemoration of the heresiarch of all heresiarch. Won’t Jews be offended since Martin Luther wrote the most powerful anti-Semitic diatribe in history calling for their persection and death? In my opinion, Pope Francis is following Christ. What did the Pharisees say when Jesus praised prostitutes and tax collectors? I understand that we don’t like what Luther stands for. Neither do I. Nor did the Pharisees like what prostitutes stood for. But what was Christ’s message? That the sins of fornication, adultery and stealing no longer mattered? No. I believe what Jesus Christ was saying, is that prostitutes and tax collectors were being true to themselves. But many of the Pharisees were being hypocrites. Let me give you an example. Let’s say a woman, without a husband and with many children, can’t make ends meet and her children are going hungry. But men abound who are willing to pay for her sexual services and allow her and her children to survive. Who will enter the kingdom of heaven, first? The one who out of love feels forced to commit sin or the one who feels no love but only pride? 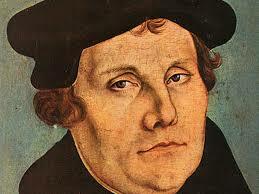 So, what is Pope Francis, what is the Catholic Church saying with respect to Luther? Can anyone really say that all of the fruits of the Reformation were bad? Let me ask Steve. Can anyone accuse Luther of being lukewarm? So, what I’m trying to say is this. Will Luther ever be canonized a Saint of the Catholic Church? I doubt it. But, can we agree that many people respect him, that many people love him and that some good fruit did accrue as a result of his rebellion? Reluctantly, yes. Can we also agree that we don’t read hearts and can’t know whether or not Luther was sincerely fighting for that which truly believed to be the Word of God? So, although I’m not going to buy nor collect any of his memorial stamps, I won’t begrudge anyone else from doing so, and I won’t second guess the Pope nor the Church for offering the Protestant world an olive branch. We shouldn’t put him on a pedestal (or a stamp)…the truth doesn’t change according to ability to stomach it. I understand the the Pope is meeting in Europe with the Lutherans in October 2017, is it just the Lutherans or is there other religions to be there also? I’m sure you didn’t do it intentionally, but the picture of Luther’s face at the top of this article led me to believe that this was the stamp that was being issued by the Vatican. I assumed too much. I can get behind that, wholeheartedly. The picture of Luther’s face at the top of this article led me to believe that this was the stamp that was being issued by the Vatican. I assumed too much. Oh, sorry. There it is. But at least I remembered to add the link in the second one. >I understand the the Pope is meeting in Europe with the Lutherans in October 2017, is it just the >Lutherans or is there other religions to be there also? Just the Lutherans at that event. But the Catholic Church is having discussions with all types of groups. The Holy Spirit is moving in a powerful way right now. Previous post: Germany Berlin All Day! Berlin Wall, Wow!